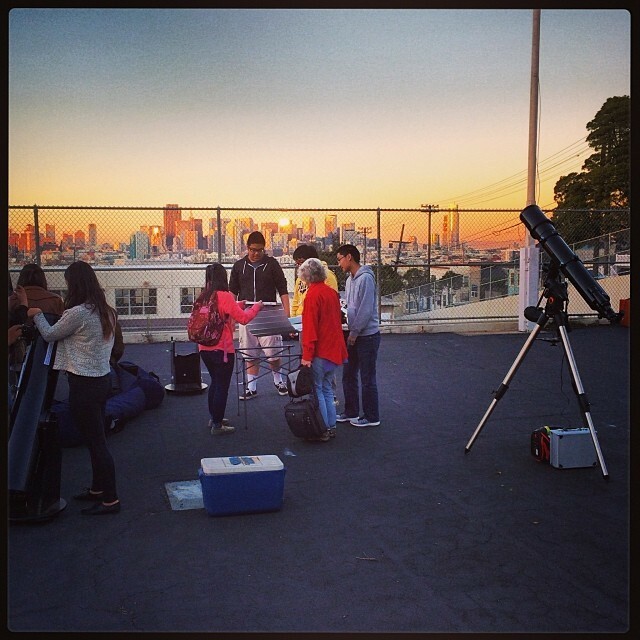 On Friday, November 22, 2013, members of SSL’s Center for Science Education (CSE), along with youth in their NASA NOVAS program, held a “star party” for the students of Downtown Continuation High School in San Francisco. This particular continuation school was setup specifically for high school youth not functioning well in regular public school settings, and they are usually not considered to be the type of students that might have an interest in science, or a chance at science careers. Nevertheless, it’s CSE’s contention that it is never too late to get any young person, no matter their background, excited and engaged with science. The November 22nd star party was open to all of Downtown’s youth, as well as their family members and a few students from other neighboring schools. The event included featured speaker Professor Darryl Stanford from City College of San Mateo, telescope viewing, getting one’s picture taken on Mars (via green screen), an inflatable planetarium show, a DIY constellation art activity, and various science demonstrations by graduate students from UC Berkeley’s Astronomy Department. Special thanks must also go to the Lisa and Douglas Goldman Fund for helping CSE purchase its telescopes, the San Francisco Amateur Astronomers for bringing their scopes to share, and Goat Hill Pizza for providing significantly discounted pizza for all! Setting Up for the Downtown Continuation High School Star Party.